In New York City, Spain or Japan, tenor Philippe Castagner is known for his moving vocal performances. In his home neighborhood of Kensington, Castagner is known for the mushrooms he finds in the woods of Pennsylvania and New Jersey. The blewits, hunter’s heart and honey mushrooms are regularly sold at La Finquanta’s Sunday produce stand. 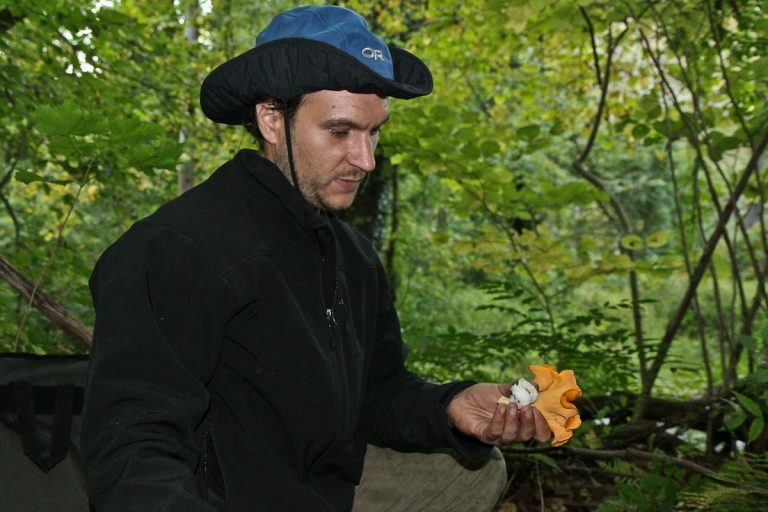 Castagner got his start as a mushroom hunter more than five years ago in Brooklyn’s Prospect Park on a patch of red chanterelles. At the time, he was living in New York City and singing with the Metropolitan Opera. Since he relocated to Philly, when he’s not practicing he’s foraging. He said it’s surprising how little he knew about the world around him. He’s fascinated by mushrooms and sees them as one of the most cooperative organisms on Earth. “They interface with mammals, they interface with plants. They have their own ends but at the same time they’re allies of our species,” he said. “They’re all around us, all the time. We only see the fruit.” Castagner explains that the mushroom is mostly underground, like an upside down tree and the stems and caps are the fruit of the tree popping out of the ground. One of Castagner’s favorite foraging spots is Ridley Creek State Park. A few days of rain, shady canopies and decaying trees create a haven for foragers. On a recent Sunday afternoon, Castagner gave soul food chef Carl Redding a brief introduction to foraging. He tries to pass his passion to others, especially those who can use the mushrooms with culinary creativity. Castagner walked Redding carefully through the forest. He recommended that Redding use the honey mushrooms they found to create a creamy soup. He also suggested that Redding join a mycological society to learn how to safely identify mushrooms for consumption. On a typical forage, he and friends split up to cover more ground. He often uses his singing talent to let fellow foragers know when he’s found something. Castagner says opera singing and mushroom foraging share a similar mindset. “They’re both about openness, about being aware of what’s going on.” Often, while out in the forest, the two become wedded. “I’m walking and thinking about my posture and my breath and all these things, and it happens naturally that I may start to sing,” he said. For more information on Philippe’s upcoming performances visit: http://www.stafford-law.com/tenors.html or follow his foraging adventures on twitter @cinnabarforager.